The French were the first to venture into the unexplored territory of Indiana. Previously inhabited solely by Native American tribes, including the Iroquois and Algonquian, French traders had established Tassinong as a trading post by 1673. In the late 1600s and early 1700s, the French established a vital trade route along the Maumee and Wabash rivers that connected southern Louisiana with Canada. To combat the encroaching British colonies and deter Native American rebellion, the French created several forts along the route, including Fort Miamis. The British gained initial control of the territory after the French and Indian War ended in 1763, and had full control after the American Revolution. Modern day Indiana became part of the Northwest Territory in 1787 and in 1800 the Indiana Territory was created. The Territory of Indiana was replaced by the state of Indiana in 1816 after a constitutional convention met and wrote the state’s first constitution. The state population steadily increased over time and Indianapolis was chosen as the new state capital in 1820. During the Civil War, Indiana, who had forbidden slavery in their first constitution, sided with the Union. The state contributed greatly to the war effort, and the Battle of Croydon took place on Indiana soil. After the war in the 1880s, natural gas was discovered in northern Indiana, leading to an economic boom. The state was also the leading developer and producer of medication, thanks to the founding of pharmaceutical company Eli Lilly & Co. The Indianapolis Motor Speedway was completed in 1909, and for a few years Indianapolis rivalled Detroit in automobile production. During this period, the Indianapolis 500, which is still today a celebrated event in the state, began and became a fiercely competitive forum for auto racing companies. After a downward turn during WWI and WWII, the Indianan economy picked back up in the 1950s and 60s. The auto and pharmaceutical industries continued to thrive in Indiana and the state became much more urban, with dramatically growing populations in several cities. Today, Indiana is home to major sports teams and event, has a diverse economy, and many metropolis areas. It has transformed from a small French trading post to an integral part of the American culture and economy. Like most of the US, the largest religious group in Indiana is Christian, comprised of mostly of Roman Catholics but also Protestant denominations including Baptists, Methodists, and Lutheran. Jews, Muslims, other religions and non-religious groups comprise the remainder of the population. Basketball is not only a sport in Indiana, but part of the culture. The historically successful Indiana University basketball team is loved across the state and locals are born and raised to love the sport. 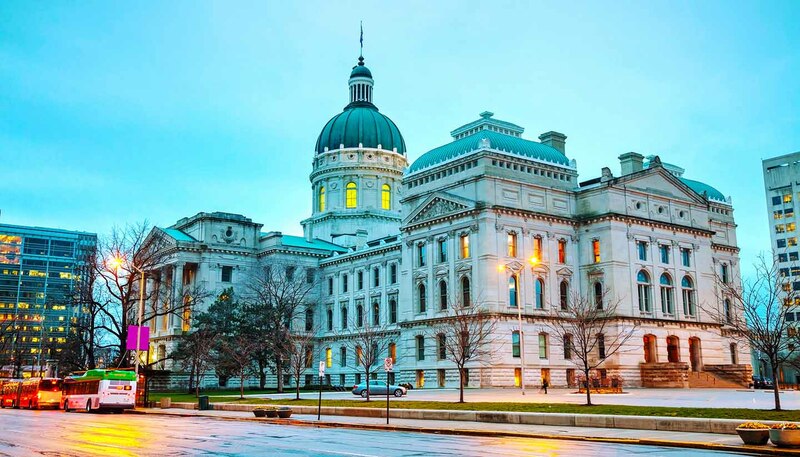 English is the official language and most widely spoken throughout the state, though a small but growing Spanish-speaking population resides in Indiana as well. There is a fairly noticeable difference between the accents of different regions, with the southern accent similar to that of the southern US and the northern region with a traditional Midwestern accent.